Although America did not officially enter the war until the Japanese attack on Pearl Harbor on December 7, 1941, peacetime conscription in Scottsville and throughout the nation commenced in the fall of 1940. 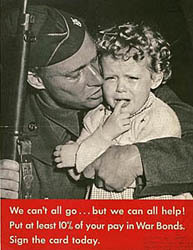 As the European war worsened during the summer of 1940, the U.S. enacted a law requiring all men between the ages of 21 and 35 to register for selective service. Under the new provision, those selected would serve for one year. In Scottsville, military registration took place at Scottsville High School under the direction of Louise Beal. The day was declared a school holiday, and the teachers volunteered to assist with registration. The words of a popular song of the period reflected the belief that the war effort would be short and swift: “I’ll be back in a year, little darling! Uncle Sam has called me, I must go!...” But little did the men and women of the time realize how long conscription would last and how many of them would eventually serve. Less than a year after the first conscription — on July 1, 1941 — the second Selective Service registration was held. This registration period was followed by a third on February 16, 1942. These conscriptions broadened the age requirement for selective service to encompass all men aged 20 to 44. Finally, in December of 1942, continual registration began for all men aged 18 and older. In the greater Scottsville community many men would ultimately don their nation’s uniform. The Trice family of Howardsville had a remarkable five sons in service. Mr. and Mrs. Charles R. Dorrier held the record in Scottsville proper with four sons in uniform. By the end of the war, the community mourned the loss of nine men, who called Scottsville home. They were killed in action across the globe—from American soil to Germany, France, Italy, and Okinawa. But the chain of events leading up to this tragic loss of lives remains to be explained. 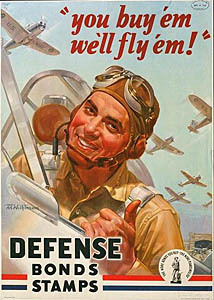 As ominous war clouds gathered over Europe and Asia in the summer of 1941, Scottsville joined the rest of the nation in expanded defense preparation. Mrs. Ben Cohen, assisted by Misses Shirley and Jane Bruce, led a drive in Scottsville to collect aluminum scrap, and E. L. Bradley headed up an effort to recruit civilian volunteers for defense work. Local residents were urged to “buy coal now” in preparation for the winter season. On November 21, Mayor T. E. Bruce was appointed Chairman of the local Defense committee. Other prominent local men served on this committee, including Edgar Bradley, W. O. Branham, G. T. Omohundro, L. G. White, the Rev. E. B. Meredith, Dr. Percy Harris, F.Paulett, James Dorrier, and A. R. Thacker. Within a few weeks, however, war-related news, local defense mobilization, and patriotic activities began to dominate the community’s attention. In mid-January, 1942, there was a barrage of articles in the local papers detailing aspects of the war effort. The Selective Service registration on February 16, the planting of Victory Gardens, the collection of old books for the servicemen, and the scarcity of Coca-Cola due to sugar shortages were just a few of the items in the local news. Under the direction of Mrs. D. H. Pitts, local women began meeting weekly in the Masonic Hall above the old Post Office on Main Street to prepare bandages for the Red Cross. Daylight saving time was instituted on February 9, 1942, and rationing commenced on the same date. Tire rationing began in January 1942, and gasoline and sugar rationing followed in May. To further conserve fuel, the highway speed limit was reduced to 40 miles per hour, and later to 35. Severely impacted by the gas and tire rations, Valmont Dairy announced in late February that it would no longer make Sunday deliveries. A ration card also was required at various points during the war to purchase many other goods, including coffee, canned food, meat, and shoes. 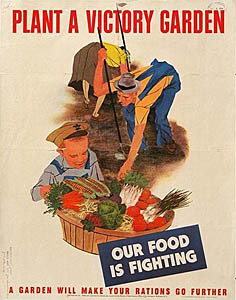 In an effort to boost production of scarce food products and lessen demand on commercial sources, the people of Scottsville planted home “Victory Gardens.” In order to allow for preservation of the foods grown by local residents, the government subsidized canning centers. 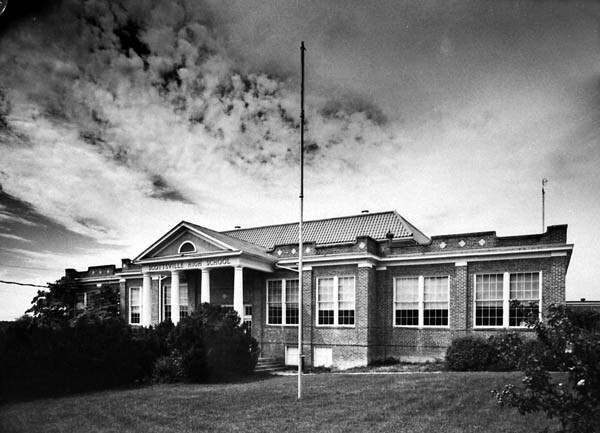 The Scottsville canning facility was opened in July 1944 in a cinder block building on the edge of the school grounds. Thomas A. Allison, Agricultural teacher at the Scottsville High School, was the chief promoter of the project and oversaw its operation. The center was an immediate success; hundreds of families used the facility to process almost 20,000 cans of food by the end of the first year. Tomatoes, vegetables, peaches, and apples were among the favorite home-canned foods. Scottsville’s citizens joined the rest of the country in a massive campaign to salvage scarce war materials like scrap iron, copper, aluminum, rubber, waster paper, rags, tin cans, and kitchen fats. No amount of scrap was too small; local children even collected the tin foil used in wrapping chewing gum. Reverend Oscar Northen of the Baptist Church and Reverend E. B. Meredith of St. John’s Episcopal Church, assisted by Homer Thacker, led the remarkably successful local scrap metal drives. Individuals, schools, and civic and charitable organizations pitched in to help with the collections, which continued throughout the war years. In another effort to defend against the perceived enemy threat from the air, an Aircraft Warning System post was established just outside of town, near the old Charles B. Harris house on Route 726, in May 1942. Eighty-four people volunteered as members of the Ground Observer Corps to maintain a 24-hour vigil. A cross-section of men and women from the community served as watchers. Chief Observer Lindsay Pitts, assisted by Randolph Phillips, exhorted the volunteers in their efforts and assured them that the “U.S. Government considers plane spotting one of the most important of all civilian defense activities.” The observers were ordered to report “anything that flies which doesn’t flap its wings” by phone to the Army Filter Center. The air spotters continued operations through 1943 before their service was discontinued. Warplanes did descend on Scottsville in great numbers beginning in 1942. Fortunately, however, they were not enemy aggressors, but U. S. Army Air Corps single engine Curtis P-40 fighters flying out of Byrd Field in Richmond. These planes made numerous simulated low-level attacks on the rickety-planked steel bridge across the James River. Scottsville’s locality had been selected for the practice attacks not only because of its proximity to Richmond but because the Horseshoe Bend of the James River was a conspicuous physiographic landmark, easily recognizable from the air by the fledgling fighter pilots. 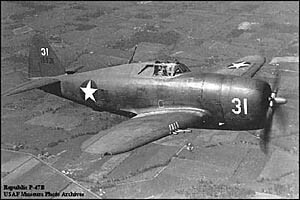 By 1943, the more powerful P-47 had replaced the P-40, and the number of daily practice runs increased. The loud noise of the approaching planes caused both children and adults to race outdoors to wave at the pilots, who swooped by at tree-top level. Engine failure caused one P-47 to crash land on what is now Dorrier Park, only a few hundred feet south of Scottsville High School. Fortunately, the pilot escaped unharmed. However, the town’s population did get a close look at the downed plane before Air Force authorities came to haul away the wreckage. The people of Scottsville exhibited their patriotism by scanning the local paper every week for news about local servicemen. In 1942, the Scottsville News reported that Lt. Howard Golladay was taking an advanced communications course at Cavalry at Fort Riley, Kansas. In June, there was word that Lt. John L. Pitts had received his wings as a pilot. In November 1943 came the sad news of Walter White’s death in a flight training accident in Arkansas. Then, in September of 1944, the Scottsville News began publishing excerpts from more than a dozen letters from Captain C. R. Dorrier, Jr., recounting his experiences in the European campaign. The letters are a remarkable personal commentary on the war in Europe from the vantage point of the soldier on the ground. One of the most concerted homefront efforts involved the sale of U.S. Defense bonds and stamps, whose proceeds helped finance the war. Schools, businesses, and civic clubs held bond-selling campaigns everywhere, including stores, the Post Office, schools, and banks. Scottsville students made weekly purchases of 25-cent savings stamps from their schools, which they then pasted into collection books. Once a student’s book was filled with 75 stamps, he or she could exchange it for a savings bond worth $18.75. If held for 10 years, the bond’s value increased to $25. By November of 1943, students had purchased a remarkable $4,281 in savings stamps and were well on their way to meeting their goal of $6,600. In addition to generating revenue through regular bond and stamp sales, the community held fund-raising events staffed by professional entertainers, celebrities, and military figures. In August of 1942, the Hollywood actress Greer Garson appeared at the Paramount Theater in Charlottesville. Three months later, the Scottsville Lions Club postponed a scheduled variety and minstrel show at the Victory Theater so that the local population could see Miss Garson and co-star Walter Pidgeon in the acclaimed patriotic movie “Mrs. Minerva.” The Lions Club held the postponed variety show on December 3, 1942. Hosted by Edward N. (“Uncle Jim”) MacWilliams of Keene, the show boasted rousing performances before a packed house—including local servicemen and several British sailors on leave from Norfolk. The event succeeded in raising more than $20,000 in bonds and stamp sales. Aside from these war-related efforts and the loss of lives suffered by the community, arguably the most significant local impact of the war occurred in 1944 when the U.S. Defense Plants Corporation built a factory to manufacture rayon tire cord in Scottsville. Located just west of town, on part of the old Valmont property, the plant held its ground-breaking ceremony in April of 1944. 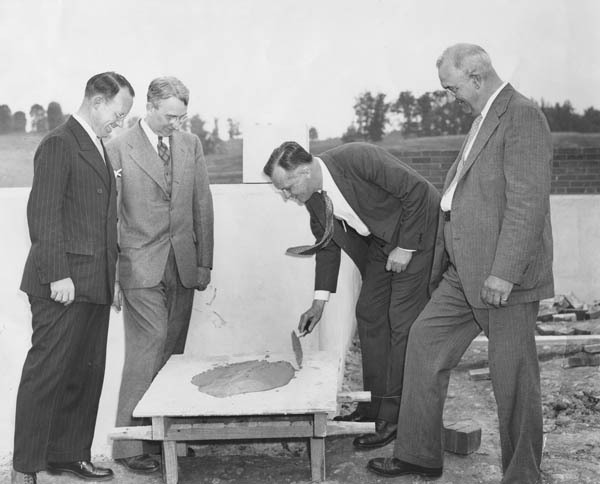 The cornerstone was laid on May 24 by Governor Colgate W. Darden, Jr., assisted by Scottsville Mayor Percy Harris. Factory production commenced late in 1944. Funded in part by the Scottsville Lions Club, Albemarle County, and the town of Scottsville, the plant was operated by the United States Rubber Company. Within one year of opening, it employed 350 people. Almost overnight, Scottsville was transformed from a rural village to an industrial town—a change that had lasting influence on the character of the community. Although enemy fire never touched Scottsville between 1941 and 1945, local citizens’ efforts and activities during this period marked the community in lasting ways. Taken collectively, the actions of citizens in Scottsville and across the nation helped to galvanize homefront morale and unite America for war. The documentation and preservation of Scottsville’s history during this critical period of national history is a project for which future generations of residents will surely be grateful. 1. 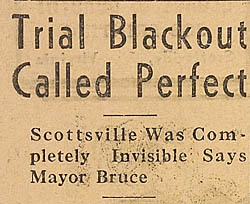 The weekly newspapers, The Scottsville News and Albemarle Courier, published up until September 1942, and its successor,The Scottsville News, published after that date. The Special Collections Library at Alderman Library has almost all the copies of the two papers for the war period, but regrettably the last issue of 1941 available in their files is November 28, 1941. 2. Pursuits of War, The People of Charlottesville and Albemarle County, Virginia, in the Second World War, by Gertrude Dana Parlier and others, published in 1948 by the Albemarle County Historical Society. 3. Of Town and the River, a short pamphlet by John Randolph Phillips published in 1976, which includes a short account of Scottsville during World War II.